INSPIRATIONAL teenager Rhea D’Mello has told the world how being born with Down syndrome will not stop her from reaching her full potential or prevent her from paving the way to a successful career. The Indian expat, a trainee teaching assistant at RIA Institute, was invited to travel to the UK to talk about her life in Bahrain and her personal struggles and aspirations at an international conference. She delivered an impressive PowerPoint presentation to an audience of 1,000 delegates. Rhea, 19, who is also a brand ambassador for a yoga organisation for the young, travelled to Birmingham, frequently referred to as the second city of England, with Christine Gordon, MBE, who founded the Adliya centre in 1999 with her husband, Dr Emad El Attar, to support and educate children with special needs. “During the conference, I was nervous about sharing my story at the start but later I was fine and spoke without any fear,” said Rhea. “It was my first time doing anything like this. “I was happy to tell people about my experiences. I get to help other students with their classwork and assist the teachers when asked. Being a part of the RIA Institute has made me independent and helped make my life interesting. I love music, dance and working with children. That’s exactly the mantra that Rhea’s mum Sylvia, 47, a secretary, and dad, David, an electrical engineer, lived by from the moment she was born. Down syndrome occurs when an individual has a full or partial extra copy of chromosome 21. This additional genetic material alters the course of development and causes the characteristics associated with the condition. A few of the common physical traits are low muscle tone, small stature, an upward slant to the eyes, and a single deep crease across the centre of the palm. Every person with Down syndrome is a unique individual and may possess these characteristics to different degrees or not at all. Quality educational programmes, a stimulating home environment, good health care and positive support from family, friends and the community enable people with Down syndrome to lead fulfilling and productive lives. “The best advice we got from Rhea’s paediatrician on the day she was born was to take one day at a time,” explained Sylvia. “We immediately accepted the fact and, ever since then, have taken great pleasure in admiring all the milestones that she has reached and surpassed. “We encourage Rhea to execute certain goals which sometimes stretch her capabilities to the limit but when she achieves those targets you can easily spot the big smile of satisfaction on her face. 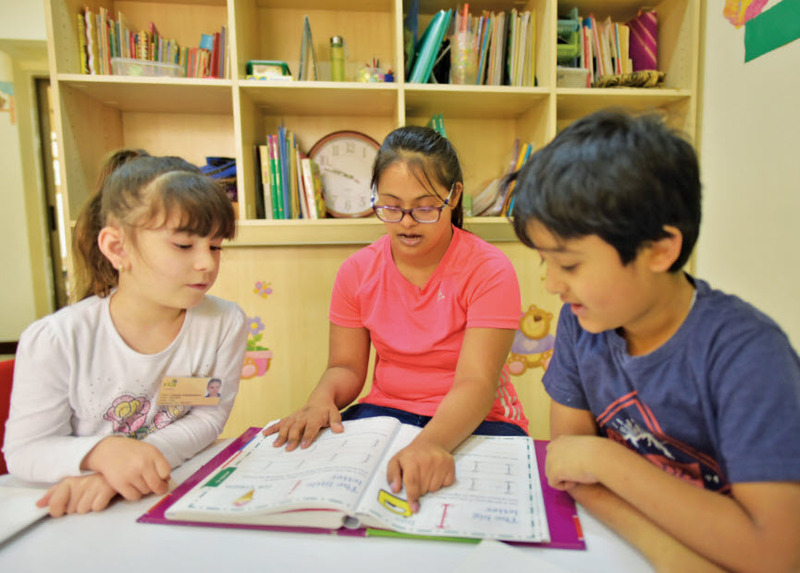 The family says Rhea’s 14-year-old sister, Richa, who attends the Indian School Bahrain, acts as her role model and has really helped her develop. The recent Inclusion International’s 17th World Congress brought together self-advocates, families, professionals and delegates from 71 countries to learn from and inspire each other. The campaigners are leading the way in making inclusion a reality for people with intellectual disabilities and their families. Sylvia added: “People with Down syndrome are pleasant, happy and lovers of life. The low IQ thing is a myth - anyone with a heart will see them as a blessing. “I know they lack in certain areas and may have other shortcomings or health issues, but who doesn’t? They, like all others, have a lot of potential. We should all allow them to be equals, not secluded in schools and society, and give them the opportunity to achieve their dreams. Although her parents could not be with her at the event, Christine said that Rhea did amazingly well. “During the short time I spent with Rhea in the UK she had impeccable manners, was organised and although was shy at first, she soon blossomed,” Christine added. Rhea and her family moved to the kingdom in 2007 after being told that Bahrain was a sociable and friendly island and accepted people from all walks of life. When Rhea was three-weeks-old, she was enrolled in an Early Intervention Programme at an NGO called Sangath Centre that helped in her physical and mental development in her home state of Goa. She later joined Chubby Cheeks Primary School, a mainstream school, until the family moved to Bahrain and she joined The New Horizon School from January 2008 to March 2017 where she continued her inclusive academic studies, until the age of 17, excelling in English, art and sports.